In the context of the paper-making industry, chlorine dioxide is used for water treatment at paper mills and for pulp bleaching. 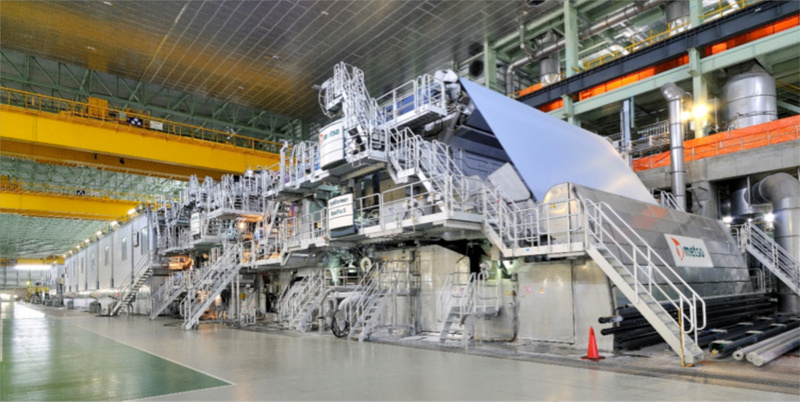 Water plays an essential role in the paper manufacturing process: it permits the fibres to be transported from the apparatus which de-fibres the wood-pulp down to the manufacturing wire of the sheet of paper. These waters (called white waters) which, as a result of technological innovations, are always subject to more advanced recycling, constitute an ideal environment for the development of biomasses, in particular bacteria and fungi, due to the presence of organic substrates, favourable temperatures and neutral or slightly alkaline pH. The development of bacteria, fungi, yeasts and algae in the pipes and tanks give rise to a viscous deposit, commonly called “slime”, which causes many problems of soiling and breakage of the continuous sheet of paper. Its uncontrolled presence generally limits the efficiency of the production cycle, and in some cases, with frequent stops of production, causes consequent relevant economic losses. Slime control by biocides addition is now a common production practice. Thanks to its bactericidal, algaecide and fungicidal properties, chlorine dioxide may be used effectively for this purpose in paper mill waters, by virtue of also being able to act in a wide pH range. The use of ClO2, in place of organic biocides and chlorine, allows to keep the plant effectively clean at low dosages (60 – 120 g/ton of paper), to reduce production downtimes, without affecting the AOX content in the paper and in the waste waters. ClO2 is added to both the raw water and the wet end and can be used in the disinfection of clarified waste waters. In this respect it can be considered the ideal agent for an integrated treatment of all the water in paper mills. Experimentation on paper mill sludge has also pointed out the effectiveness of chlorine dioxide and sodium chlorite in scavenging unpleasant odours due to anaerobic fermentation. In the treatment of pulp, chlorine dioxide acts as a bleaching agent without altering its mechanical properties. ClO2, in fact, acts on the lignin, and to a lesser degree on the hemicelluloses, with the formation of ligninic and chloroligninic acids, in a selective way without degrading the cellulose polymer. At the same time, chlorine dioxide maintains high viscosity values, which is an important parameter in the production of regenerated cellulose (rayon yarn and viscose staple), and of tear index and breaking length, which are relevant parameters in the paper-making process. Pulp bleaching has several phases and is a function of the cooking process: historically the first process was acid by means of sulphite. It has now been replaced by alkaline cooking with sodium sulphate called the “Kraft” process. This choice was prompted by two reasons: first, to facilitate the recovery of cooking salts and the subsequent reduction in the environmental problem of the exhausted liquor, and second, because of better mechanical properties of the resulting fibre. However, an alkaline cooking has a negative effect on the optical characteristics of the unbleached pulp and needs a stronger bleaching. Initially, this was an alternating sequence of acid chlorination (indicated as C) and of alkaline extractions (indicated as E), followed by a final treatment with hypochlorite (H); the entire phase sequence was generally represented as C/E/C/E/H. Once the superior capacity of chlorine dioxide (D) was recognized, sequences of C/E/D/E/D type were adopted. Therefore environmental motivations have successfully forced pulp producers to replace chlorine gas with chlorine dioxide, obtaining celluloses known as ECF (Elemental Chlorine Free) with better mechanical and optical characteristics. On an emotional drive to completely eliminate all chemical molecules containing chlorine atoms in any form, consumers were informed of the necessity to use cellulose bleached without chlorine- and chlorine derivatives (TCF or Totally Chlorine Free). This decision has brought forth pulps with lower mechanical and optical characteristics, produced with much lower yields of wood and use of more costly reagents, such as hydrogen peroxide or ozone.